My family and I spent a week in the Florida Keys several weeks ago, and since then I’ve had a hard time getting island food out of my mind. So it seemed appropriate that I visit with my islander tribe, the Tamar, and use an ingredient close to their heart, the lime. The idea for designing a dish around homemade lime mayonnaise came to me at 3:00 in the morning, and luckily I remembered it the next day. 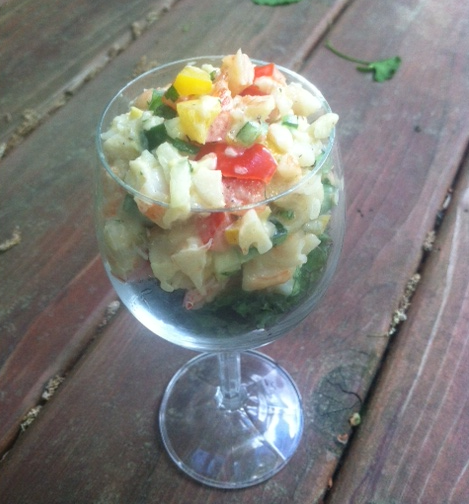 After discussing it for about five minutes, Alan and I decided lime mayonnaise would work really well in shrimp salad. Yes, I know shrimp is not kosher, but the Tamar, like the Sakhar, do not follow the food laws. With all the fresh seafood they have, I have a hard time blaming them. If, however, you are kosher, you can substitute tuna or salmon for shrimp. I love homemade mayonnaise because nothing beats the flavor. Besides, most jarred mayonnaise use soybean oil, and since soybeans are a high gylcemic food, they are not on Alan’s paleo diet. Some people do not like to make homemade mayonnaise because it usually involves using raw egg yolks. Though studies suggest that the high acid content of mayonnaise kills any bacteria in the raw eggs, we decided to use a method that involves cooking the egg yolks over a double boiler. And I hope that once you’ve made homemade mayonnaise, you’ll be as hooked as I am. It really is yummy! 1. Fill a two quart pot about one quarter way with water and place over a medium heat. Once water is simmering, turn down heat to low. 2. Combine yolks, half of the lime juice, and salt in a metal bowl and place over the pot. Whisk until egg mixture is somewhat thick and frothy (Do not let the eggs scramble). 3. Remove egg mixture from the heat and while whisking, add olive oil slowly. Start with a few drops at a time and whisk mixture continuously to begin an emulsion. Once an emulsion begins to form, gradually add oil in a very thin stream and continue to whisk until you have added half of the oil. 4. Add the honey and the rest of the lime juice. 5. 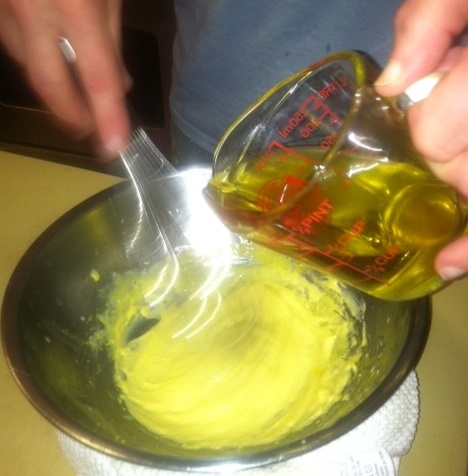 Add the rest of the oil in a thin stream while whisking. 6. Add ginger and nutmeg. 7. Add salt and white pepper to taste. 1. Heat a pan on a medium heat and coat with olive oil. 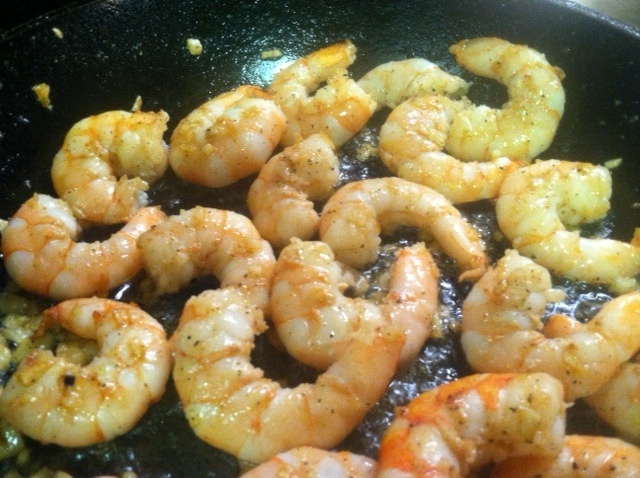 Add shrimp and garlic to pan and sauté. Flip the shrimp after about a minute or so. Cook shrimp until they all just turn pink. 2. Chill shrimp in refrigerator. 3. Cut or chop shrimp into ¼ – ½ inch pieces and combine with onion, peppers, and cilantro. 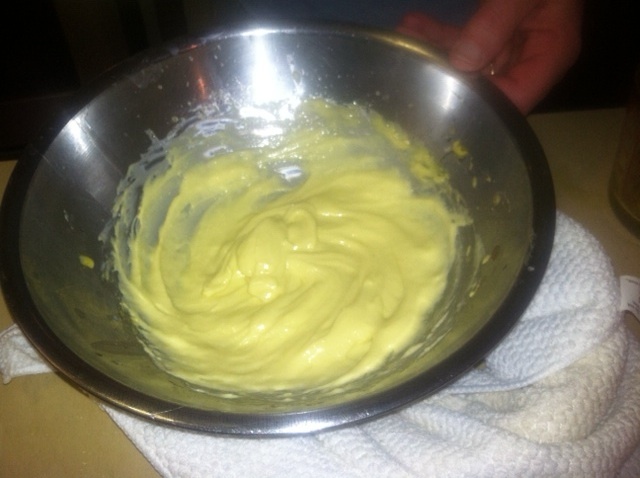 Add just enough of the lime mayonnaise to coat the shrimp mixture.